Whether it's a decorative tap cover, a clock or simply a wall hanging, this authentic barrel end is a wonderful addition to any wall. Made from authentic, coopered American White Oak. Two versions availiable - With Tap and No Tap. 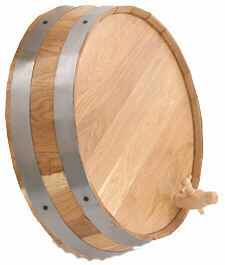 Please note: Some barrels require 2-3 weeks for shipping due to the hand crafted process.